Welcome to the Pavelka Project! Many of you have been signed up for a VERY long time in anticipation of this awesome event. If you have NOT already signed up for the email, please do so now in the box at the top right of the page or just below. Signing up for the email will automatically inform you when new tutorials are posted. With each and every monthly project that we do here, you will essentially be receiving TWO tutorials. There’s ONE tutorial that Lisa presents in her book. There’s another tutorial that I will present as a spin off of her project. You are welcome to do either one. For the complete listing of materials for Lisa Pavelka’s project, please see page 160. Your choice of polymer clay – I prefer Premo! Tiny-medium sized beads and/or gemstones for embellishments. Gather your supplies as stated above. Please do NOT feel that you HAVE to use everything listed above. This is your project, use what you have. Condition your clay. This is a very important part of claying. Please do NOT skip this step. Once your clay is conditioned, roll out a .5 ounce portion on the 2nd largest setting of your pasta machine. Using a brayer, gently roll the clay flat onto your surface. Do Not Use A Release Agent. I know this is surprising, but you will LOVE why at the end. Trust me. 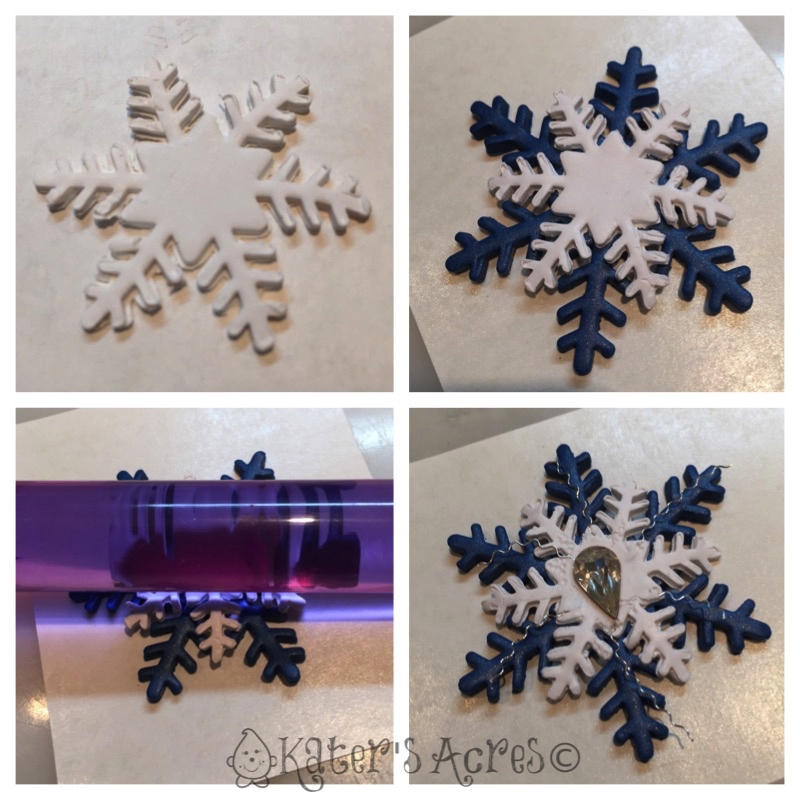 Press your snowflake cutter into the clay. Be sure to press it in very firmly so that it “cuts” all those little spidery pieces & edges. Do NOT remove the cutter, but gently “peel” away the clay on the outside edges of your cutter. Once all the remaining slab of clay is peeled away, lift your cutter. You will not be left with a snowflake that lots of “gunk” in it’s crevices (sorry … these are delicate shapes & there’s NO way to avoid this). Using a knitting needle or other blunt needle type tool, gently remove all the excess clay from the snowflake. This should be fairly easy because the snowflake will be gently “adhered” to your work surface. When all the clay that you can possibly remove with the knitting need is gone, gently slip an exacto knife under the snowflake & wiggle to lift it. You can see in the photo all the extra “gunk” left behind. If you would have used a release agent, this would have been that many more details to clean. Clean the edges while gently holding your snowflake in your hand. Be careful! Do no squeeze, pinch, or pull. It will distort your flake. This might take some practice & a few attempts as well. Be patient. You CAN do it! The photo in the top right shows my snowflake after I have cleaned the edges very delicately with a few sculpting tools. Now it’s time for your snowflake center! If you have used colored clay like I did, please wash your hands so you do not contaminate your white clay. Repeat the exact same procedure as above with these modifications. Roll your white clay out to the 4th smallest setting on your pasta machine. 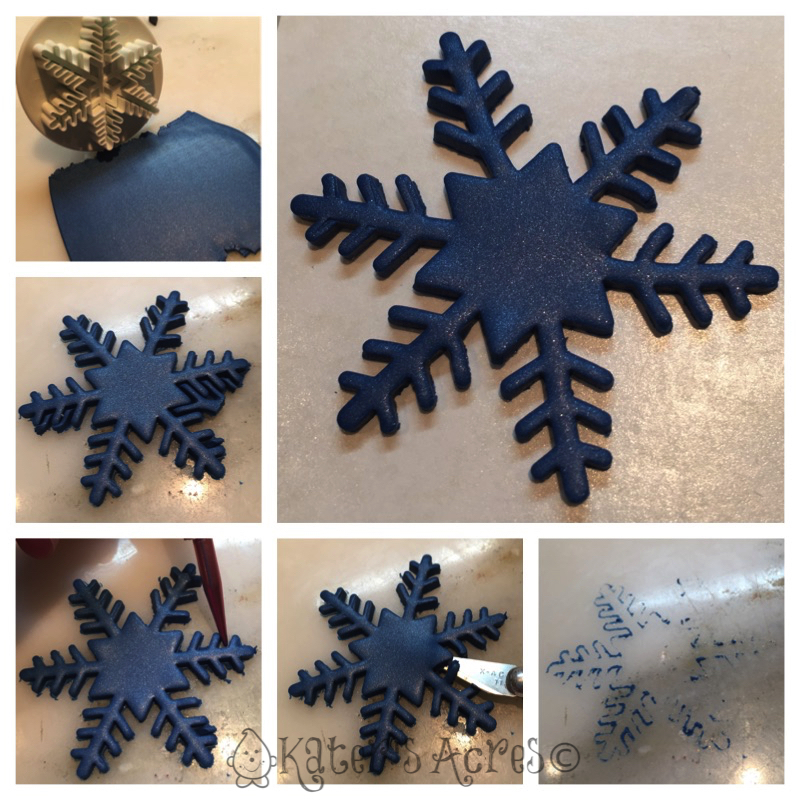 Cut your snowflake from one size smaller cutter than you used for your first snowflake. Repeat the steps as noted above. Once your snowflake is all cleaned up, decide how you want it to sit on the larger flake. I chose to place mine juxtaposing the first flake in the gaps of the first stems. Place your large snowflake on a small piece of paper (this will help it be portable). 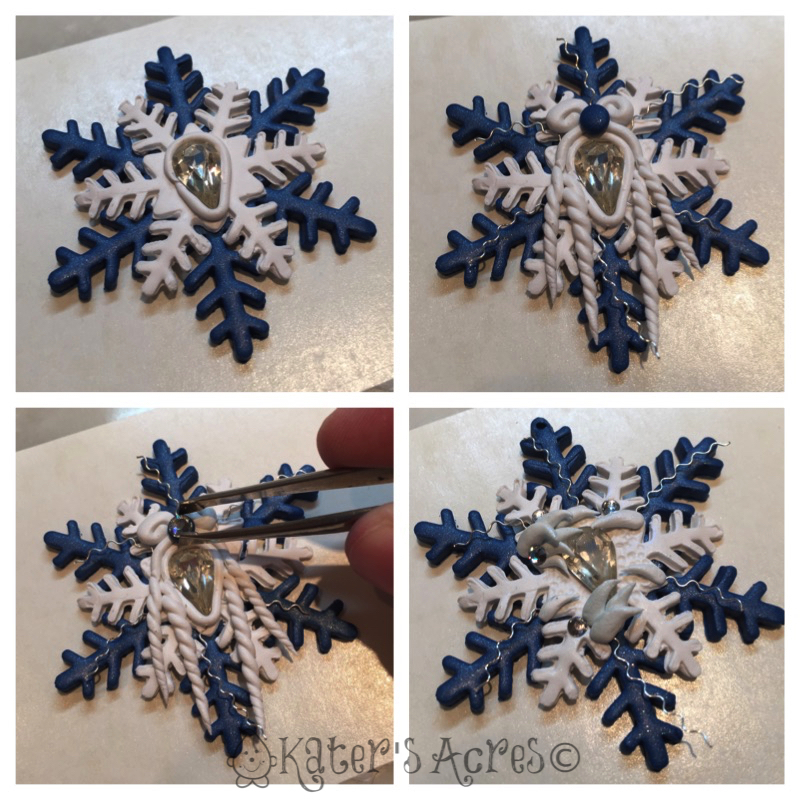 Gently set your smaller snowflake on top of the larger snowflake. Using your fingers or a blunt object, place the spines of the snowflake exactly as you want them to sit. If you skip this step your snowflake may have “bends” in its spines. Use an acrylic brayer to GENTLY join the two pieces together. Choose one of your fab crystals and place it onto your snowflake making a slight indent into the clay. Gently LIFT the crystal back out with a sharp object. Apply a drop of TLS or Bake & Bond to the indentation. Again, press your crystal back down into the indent, pressing firmly to join the crystal to the clay. All crystals are not created equally. There are all different kinds of crystals in the world. You do not have to use the most expensive or the most elegant. Your crystal doesn’t even have to be clear. But … your crystal does need to be made of glass. Glass will not melt in the oven while you bake your clay. Adding glass crystals & rhinestones to your work is an excellent way to bring sparkle, shine, & life to a piece that otherwise might be very plain. The crystal that I used is a vintage crystal with a slight yellow cast to it. I have purchased several crystals from B’Sue Boutiques. Right now just for each of you, Brenda has generously put together a few grab bags of mixed crystals in all colors, sizes, and shapes. You have to hurry. There aren’t very many bags of these available (all are different, the picture is a representative sample only), but they are very affordable at just $4.95 a piece. BUY THEM NOW. For this week’s project in Lisa’s book, you will see she uses a skinner blend jelly roll, textured clay, striped stack, & wire to accent her pendant. Here’s the idea, whatever you do, you want to make sure that your crystal is suspended in the clay and that your crystal is the front & center of your piece. Play with there overall look & design of your piece. Do not put a time limit on yourself for this. You can see my snowflake started out a certain way & did not end up the way it started. 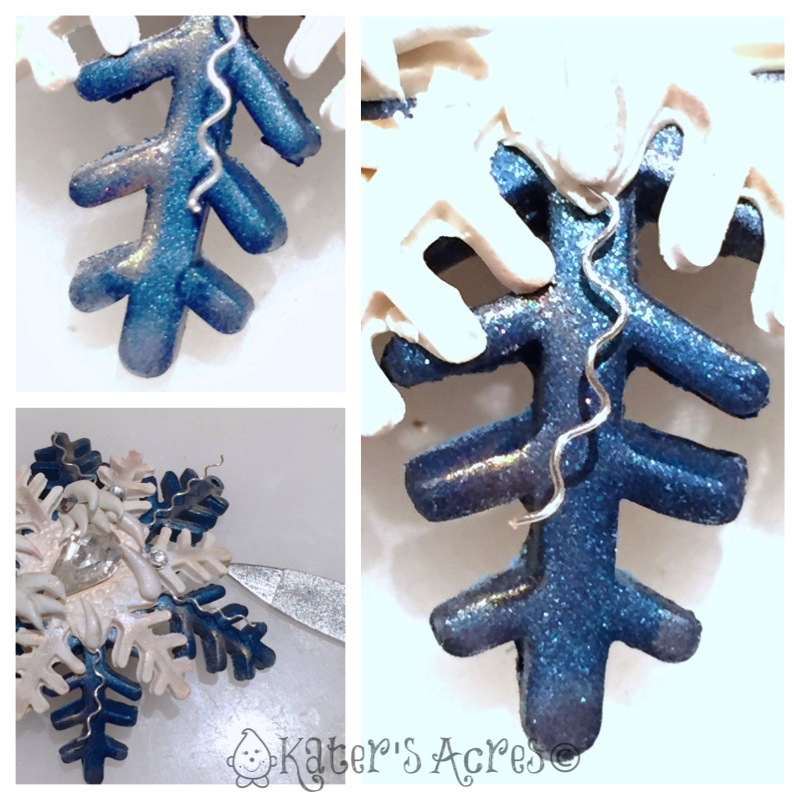 I literally worked on this little snowflake pendant for over an hour until I was happy with it. In her book, Lisa uses wire to “suspend” her crystal. I used polymer clay to suspend my crystal by placing little drops & puffs of white clay (snow) all around. Polymer clay & crystals look great together. But adding a tiny dusting of a surface treatment adds a touch of luster and pizazz that your piece might like otherwise. Use a huge & fluffy brush to apply your mica powders to your clay. Be careful with mica powder. Mica powder is very fine. Do not breathe it in! A little bit goes a very long way. I used the following perfect pearls on my piece: Interference Blue, Interference Gold, & a touch of silver too. Bake your snowflake in the oven at 275 degrees for 45 minutes. Hint: I baked my snowflake on top of a large glass cabochon that was curved to give my snowflake a domed shape, instead of being flat and boring. Once your snowflake is completely cooled, remove it from the oven. Now it’s time for the hard part! Take a good look at your snowflake. You know how careful you were to make those edges neat and tidy? Well … now that’s it’s baked you can attack them with great effort and really make a difference to your snowflake. Using a small metal nail file gently sand between each and every spine of your snowflake. This step will leave a mice, professional, and gorgeous finish. As a bonus, it will also keep the clay from getting caught on your clothes when you wear it. I know it’s hard to tell, but if you look at the picture at left, the top blue spine has not been filed yet, the rightmost blue spine has. Seal your snowflake using Varathane varnish, paying special attention to keep clear coat off your glass crystal. The Pavelka Project is done in conjunction with Lisa Pavelka. All tutorials are retaught here with her expressed permission. Please read the most common FAQS here. Oh my Gawsh!!!! This is beautiful!! !